1) Cleveland Cavaliers: Andrew Wiggins, SG/SF, Kansas, Fr. 2) Milwaukee Bucks: Jabari Parker, SF/PF, Duke, Fr. 3) Philadelphia 76ers: Joel Embiid, C, Kansas, Fr. 5) Utah Jazz: Aaron Gordon, SF/PF, Arizona, Fr. 6) Boston Celtics: Marcus Smart, SG/PG, Oklahoma State, Soph. 7) Los Angeles Lakers: Julius Randle, PF, Kentucky, Fr. 8) Sacramento Kings: Noah Vonleh, PF, Indiana, Fr. 9) Charlotte Hornets: James Young, SG/SF Kentucky, Fr. 10) Philadelphia 76ers: Zach LaVine, PG/SG, UCLA, Fr. 11) Denver Nuggets: Nik Stauskas, SG, Michigan, Soph. 15) Atlanta Hawks: Gary Harris, SG, Michigan State, Soph. 16) Chicago Bulls: Adreian Payne, PF/C, Michigan State, Sr.
17) Boston Celtics: Doug McDermott, SF, Creighton, Sr.
18) Phoenix Suns: Kyle Anderson, PG/SF, UCLA, Soph. 19) Chicago Bulls: Elfrid Payton, PG, Louisiana-Monroe, Jr.
20) Toronto Raptors: Tyler Ennis, PG, Syracuse, Fr. 22) Memphis Grizzlies: Glenn Robinson III, SF, Michigan, Soph. 24) Charlotte Hornets: TJ Warren, SF, NC State, Soph. 26) Miami Heat: Shabazz Napier, PG, UCONN, Sr.
28) Los Angeles Clippers: Isaiah Austin, PF, Baylor, Soph. 29) Oklahoma City Thunder: Spencer Dinwiddie, PG/SG, Colorado, Jr.
30) San Antonio Spurs: Mitch McGary, PF/C, Michigan, Soph. The Cleveland Cavaliers surprised everyone by winning the draft lottery for the third time in four years. They will be under intense pressure draft a player that can get the team into the playoffs and out of the gutter. Teams like Minnesota – tenth straight year with a lottery pick – and Sacramento – seventh straight year with a top seventh pick – need a good draft to help them escape the “basketball purgatory” they have been living in the past few seasons. While a team like the Philadelphia 76ers, which tied a NBA record with twenty-six straight loses, needs to add players just to field a team that resembles a NBA franchise. With a month left to go before draft night, a buzz of curiosity surrounds all those involved. This draft promises to have a lot of unexpected twists and turns, with no one knowing what exact to expect come June 26th. With that being said, here is my first mock draft for 2014. 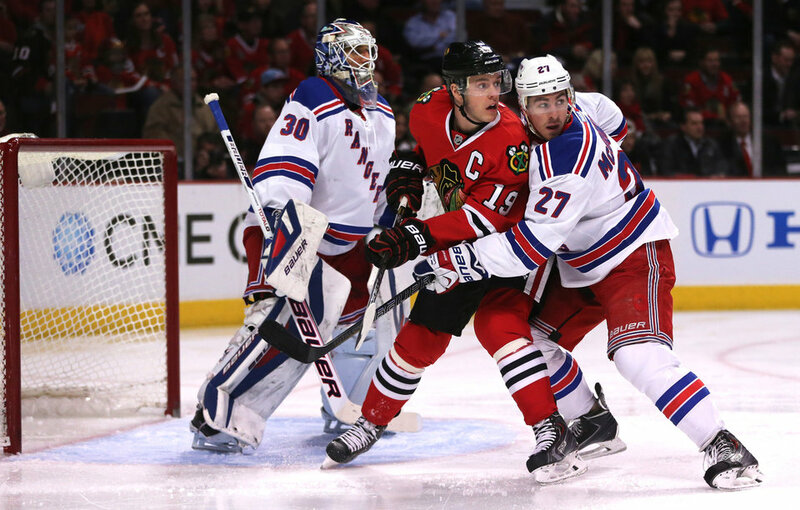 Why it Will be the Blackhawks and the Rangers in the Stanley Cup Finals. First we have the New York Rangers, who finished second in the Metropolitan Division in the Eastern Conference. They have one of the best goalies in the NHL playoffs, Henrik Lundqvist, between the pipes. This postseason he has a 1.99 GAA and a .931 save percent. Those are good enough for second and tied for first among playoff goalies.The Rangers have also been stellar on special teams. During the Pittsburgh series, the Penguins were one for twenty on powerplays. Great defense and special teams are the recipe for any team trying to make a deep playoff run, but the Rangers also possess a very well balanced and potent offensive attack. The Rangers second line (Richards, St.Louis, and Hagelin) and third line (Brassard, Zuccarello, and Pouliot) have scored twenty-four and twenty-three points, respectively. That is great offensive production for a team playing such good defense. If they can shut down the Canadiens and P.K. Subban, who is playing like a man possessed, like they shut down the Penguins, then Rangers’ fans can start buying their finals tickets ASAP. Then there are the Chicago Blackhawks. They finished third in the Central Divison in the Western Conference. If the Rangers have one of best goalies in the playoffs, then the Blawkhawks have the other. Corey Crawford has a .197 GAA and a .931 save percentage, which ranks first and tied for first among goalies still in the playoffs. But that’s not all – the Blackhawks lead the league with a +/- 6 and a 91.7 percent on the penalty kill in this years playoffs. The hawks are just as stingy as the Rangers when it comes to defense and special-teams. The Blackhawks are also great in close games, they have a 5-2 record in games decided by one goal. With grit, tough defense, and a potent offense attack lead by their first line and first defensive paring (46pts by Toews, Sharp, Hossa, Keith, and Seabrook) the Blackhawks have a chance to make their second straight trip to the Stanley Cup finals. Both these teams excel in the facets of hockey that lead teams to the finals: Defense and Special Teams. They also have veteran players who have been there before. The Blackhawks are the reigning Stanley Cup champions and the Rangers have two players (Richards and St.Louis) that won with the Tampa Bay Lighting in 2003. With all these facts working for the Blackhawks and Rangers, how can you think they won’t make it to the Stanley Cup finals? The 2014 NFL Draft is in the books, and the Bears – once again – had plenty of holes to fill. The Bears finished second in the NFC North with an 8-8 and just missed the playoffs for another year. With the twenty-fifth rated team defense last year and an aging roster, the Bears needed the draft to bring fresh legs and an influx of new talent to help propel the team back into the playoffs. Below are the teams picks along with my grades for each player.